Today I was planning on writing about a salad, but then I took one look at my photo archives and remembered that I forgot to share this rather magnificent Blueberry Bait Cake with you all and it superseded the salad for the day, but don’t worry that will be next. Now on to the magnificence of this deceptively humble looking cake. 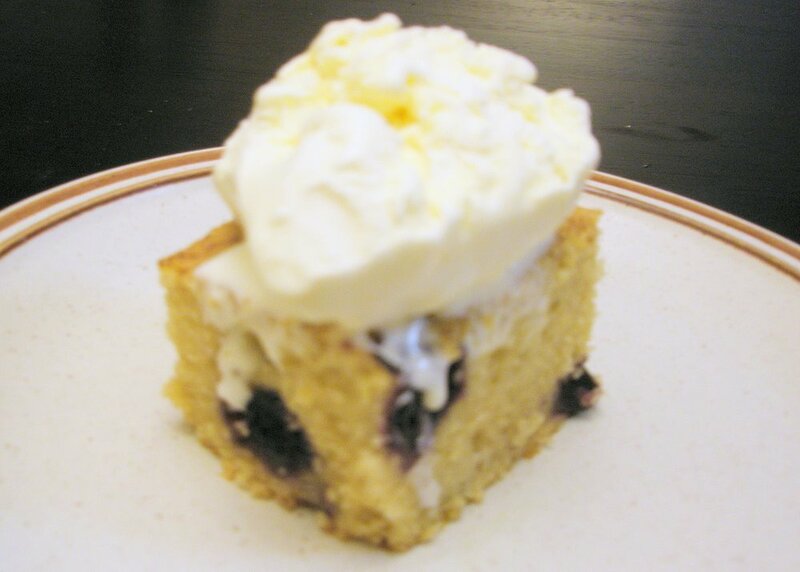 Incredibly moist and chock full of blueberries it is the perfect use of the seasons berry bounty and totally irresistible. When I first came across this recipe I wasn’t so enamored with it even though my salivary glands didn’t agree, and I patently refused to make it because it turned the unassuming blueberry into a vehicle for dietary destruction. I kept coming back to it though, and decided to see if I could trim the fat without trimming the flavor. Now I am happy to report that my experiment was wildly successful (trust me there is no room for humility here). The cake is tender, sweet, and moist; it’s practically everything it should be in terms of taste and while it’s not going to win any presentation awards I couldn’t care less. This cake is fantastic alone, but if you want the adoration of friends, family, and lovers you need to serve it warm with a dollop of vanilla ice cream over top. The ice cream will melt and moisten the cake just a touch and you’ll need only one bite to know you’re in heaven. For the cake beat together the butter, yogurt, and sugar until light and fluffy, about 1 min. Next add in the dry ingredients and stir just until combined. Next add in the milk and lemon juice and mix until you form a cohesive batter. Toss the blueberries with the flour and then gently stir into batter. Spread evenly into a greased 13×9 pan and then top with the remaining blueberries and cinnamon. Bake for 45-50 minuets until toothpick inserted into the center of the cake come out clean. Allow to cool in pan on wire rack for at least 20 min. then slice and serve with a dollop of whipped cream or ice cream over top.